Following the modules there is a mock assessment so you can check you are ready before moving on to the final graded online assessment. We estimate users will take around 6 to 8 hours to work through the four course modules. The graded end of course assessment is split into two sections, totalling 2 ½ hours. 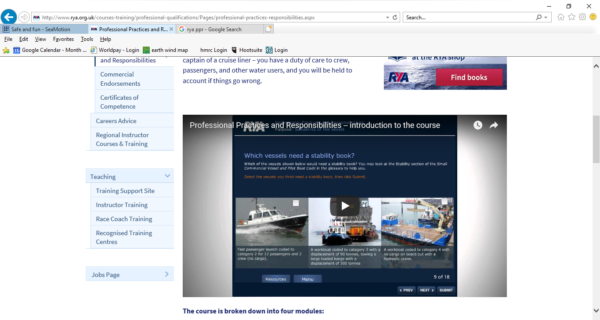 The RYA book “Commercial Regulations for small vessels” complements this course, and can be found in our online shop. The PPR course is run as an online course. When you book the course we will send you a user name and password for you to log in to the onoine system to access the course. You will have remote access to an instructor who will be on hand to help if you have any queries during the online course. A taster can be found below.